Head Coach John Mulvihill of Cardiff Blues. Pic: Simon King/Replay Images. 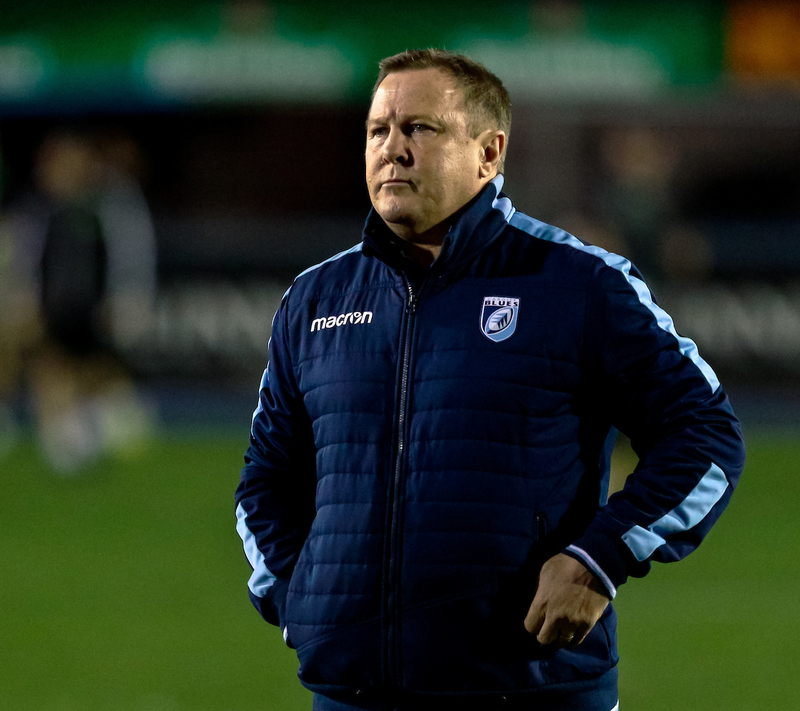 John Mulvihill has admitted Cardiff Blues are relying on others to help them make the Guinness Pro14 play-offs. The Blues needed to maintain their recent good form away to Munster on Friday night, but instead they crashed to a 45-21 defeat. Mulvihill’s side did manage to score three tries, but they failed to secure a bonus point, leaving them needing favours from others sides if they are to finish in the top three of Conference A. The Blues must now beat Connacht away from home and overcome the Ospreys on Judgement Day. Even then, they must pin their hopes on Connacht slipping up against Zebre or Munster. Mulvihill said: “It’s taken out of our hands a little bit and next week is the decider. “We’ll probably all sit in front of the TV and pray for a Zebre win [against Connacht] , but regardless of what happens there it comes down to a grand final – two really big weeks with Connacht and then [if] we get a good win there, we have to beat the Ospreys and hope Munster do us a favour against Connacht. Munster won a thrilling nine-try game in front of a sell-out crowd at Cork’s Independent Park to guarantee their place in the latter stages. It was a battle between the power of the Munster pack and the brilliance of Blues’ backs, with the visitors’ defeat meaning they now have to win their two remaining games to have any hope of securing a play-off spot in Conference A.
Jean Kleyn, CJ Stander, Conor Murray, Sammy Arnold, Andrew Conway and Chris Farrell scored Munster’s tries. Tyler Bleyendaal converted five and kicked a penalty while JJ Hanrahan also added a conversion. Tomos Williams, Aled Summerhill and Ray Lee-Lo crossed for the Blues’ tries, all of which Gareth Anscombe converted. Both teams made late changes with Munster’s Keith Earls and the visitors’ Jarrod Evans forced to withdraw. Munster had the first chance for points but Bleyendaal’s penalty attempt was held up by the wind and fell short, before the Blues went ahead with an excellent try. From inside his own half, Lee-Lo tore the defence apart before feeding Tomos Williams, who held off the cover defence to score. Bleyendaal put his side on the scoreboard with a simple penalty, awarded against Blues’ lock, Seb Davies, for a no-arms tackle. Minutes later, Davies repeated the offence and the hosts capitalised to score their first try when Farrell forced his way over from close range. Bleyendaal converted to give Munster a 10-7 lead at the end of the first quarter. Despite playing against the wind, the home side continued to dominate the half and it came as no surprise when they extended their lead when Kleyn rewarded a period of forward pressure for their second try. After 36 minutes, Munster suffered a blow when Murray departed for a head injury assessment, with Alby Matthewson introduced in his place. Two minutes later, the hosts suffered another setback when the Blues produced another stunning score with brilliant inter-play creating a try for Summerhill. Anscombe converted to leave his side trailing 17-14 at the interval, following a half in which they had barely featured. Murray returned for the restart but the Blues began the second half strongly and should have drawn level but Anscombe surprisingly missed an easy penalty. It mattered little as moments later, Billy Holland was penalised for a late tackle on Anscombe, which resulted in Tomos Williams taking the penalty quickly to send Lee-Lo over. Munster introduced Stander in place of Arno Botha and it was the Ireland international who put them back in front with their third try before Murray added a fourth. Murray departed but Munster maintained their dominance with Conway and Arnold crossing in the final quarter to ensure the valiant Blues came away with nothing.